Unranked: James Corden, The Late Late Show with James Corden, CBS. Corden is still growing into the role, having only taken over The Late Late Show at the end of March. He's exceedingly polite, which is pleasant but also often kind of boring. He’s a solid conversationalist, and can ingratiate himself with his guests without pandering, but the decision to interview multiple guests at the same time often leads to awkward and uncomfortable interactions. He's only been doing this for two months, though, so he still deserves the benefit of the doubt. It's too early to accurately rank him. 7. Andy Cohen, Watch What Happens: Live, Bravo. Cohen's not a comedian—he's a former network executive and producer who moved in front of the camera to host this show. Still, Watch What Happens: Live is a comedy talk show that airs every night on Bravo at 11 PM. (It's okay if you thought it aired on E—I did too.) Cohen is actually a perfect host for a talk show devoted to celebrity gossip and reality TV, and although his persona can verge on being a stereotype, he seems earnestly interested in his guests and the topics he covers. He's at the bottom of this list because, even if I respect his show for what it is and his ability as its host, it's still a very specific niche program. Your appreciation of the show hinges on how you value the ephemeral kind of pop culture that this show focuses on. 6. Jimmy Fallon, The Tonight Show Starring Jimmy Fallon, NBC. The current king of late-night is definitely a step up from Jay Leno. There are two major problems with Fallon, both of which are well-known and regularly pointed out by his critics: he fawns ridiculously over every guest with an enthusiasm that often feels unmerited, and too much of his comedy consists of placing famous people in weird or wacky situations. Fallon is an upbeat, likable host, and that’s put to good use in his monologues and some of his regular bits. Like his show he can be tiring, though, like he’s constantly asking you if you're having fun yet. 5. Seth Meyers, Late Night with Seth Meyers, NBC. Seth Meyers was a good Weekend Update host on Saturday Night Live, and the way he snaps into a joke serves him well during the first half of each episode of Late Night. He's not a bad interviewer, per se, but more than most hosts he often feels like he's just going through the motions when he's talking to a guest. When he's interviewing a guest he's genuinely enthused in, as when he had comic book writer Matt Fraction on last month, he's a gracious, informed and illuminating conversationalist. He’s only been on the job for a little over a year, so there's still untapped potential here. 4. Larry Wilmore, The Nightly Show with Larry Wilmore, Comedy Central. Larry Wilmore is another new host, taking over Colbert's old Comedy Central timeslot in January. His show was almost fully realized at launch, though, alternating between Wilmore's hilarious commentary on politics and social issues and similar discussions with a panel of pundits and comedians. Even though this is the most serious show on the list, it's also one of the funniest. Wilmore has quickly grown into a good moderator and was always accomplished at discussing the issues, and would be higher on this list if he was just a bit less reserved. His show blurs the line between comedy and commentary even more than The Daily Show, and its frequent focus on racial issues makes it one of the most important comedy shows on TV today. 3. Jimmy Kimmel, Jimmy Kimmel Live!, ABC. Kimmel's gone out of his way to claim Letterman's legacy. There might be too much smarm in his sarcasm to truly follow in Dave's footsteps, but Kimmel has almost completely redeemed himself from his boorish Man Show persona of the 90s. Along with Conan O'Brien, Kimmel produces the best of the traditional network late-night talk shows, combining solid interviews with well-written jokes and clever bits. The show's fixation with celebrity cameos might bring it a lot of attention, but often feels like a shortcut. There's nothing surprising about a star showing up to make fun of their image anymore, and those bits are only as good as the celebrity's performance, which means they’re often forgettable. Kimmel's grown into a respectable talk show host, though, and his show is definitely watchable. 2. Conan O'Brien, Conan, TBS. Conan often feels like the forgotten man of late-night, but he's still making good TV for the erstwhile Superstation. He remains the closest in spirit to Letterman, with a deep love for absurdity and a commitment to remote segments that let Conan show off his razor sharp wit. And although he's been a gracious and often insightful interviewer of celebrities since outgrowing his early awkwardness at some point in the mid 1990s, Conan doesn't rely on celebrity interaction for comedy or attention. Conan's show isn't as inventive or energetic as his Late Night was for NBC, but his style survived the transition to an earlier time slot better than Letterman's did, and he remains the best conventional talk show host on TV. He probably has more to fear from Stephen Colbert than anybody else—both are good-natured and fundamentally goofy, and Colbert could easily steal some of Conan's loyal viewers. 1. Jon Stewart, The Daily Show with Jon Stewart, Comedy Central. Enjoy him while it lasts. Stewart's leaving The Daily Show in August, making him the fifth late-night host in under a year to leave their show. We know what Colbert will be doing, and most expect Letterman to retire from public view like his mentor Johnny Carson. Stewart's future is unknown, though. Will he direct more movies? Refocus on stand-up? Create a new TV show? Time will tell. We have two months left of his whip smart commentary, from his resignation over how hopeless our political system has become, to his excoriation of a dishonest and incompetent news media. He’s been an invaluable part of TV and American political life for a decade and a half, and his nightly presence will be missed. One thing that struck me during Letterman’s long farewell was how little I’d seen of his CBS show. That career-spanning montage at the end of his last episode was powerful but highlighted how so much of what Letterman will be remembered for came during his NBC run. His years on CBS were almost like a very lucrative reward for the groundbreaking stuff he did on NBC. Even with his best material behind him, though, even with his show regularly losing in the ratings to Fallon and Kimmel, Letterman was still the preeminent figure in late-night up to his finale, a living legend who had done as much to shape the current state of comedy as anybody else. And of course there’s more late-night comedy now than ever before—even with Letterman gone the late-night talk show schedule is incredibly cluttered, with the three classic broadcast networks and a handful of cable stations airing nightly talk shows. If you’re a Letterman stalwart looking for a new show to take Dave’s place on your DVR, or if you need something to help pass the time until Stephen Colbert’s CBS debut on September 8, there are more options than you probably care to explore. 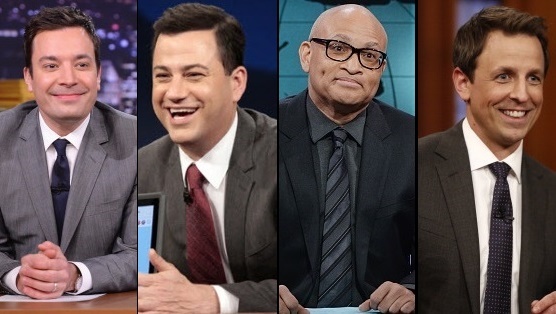 So we’ll help you out and rank the current roster of late-night talk show hosts. We’re only looking at late-night talk shows where comedy is the central component (sorry, Charlie Rose and Tavis Smiley) and that air on a nightly basis (sorry, John Oliver and Grace Helbig). We totally included Last Call with Carson Daly in our first draft until we remembered that Daly basically just introduces the show at this point and rarely does any interviews or comedy bits. Now that the caveats and qualifiers are over let’s get down to business.